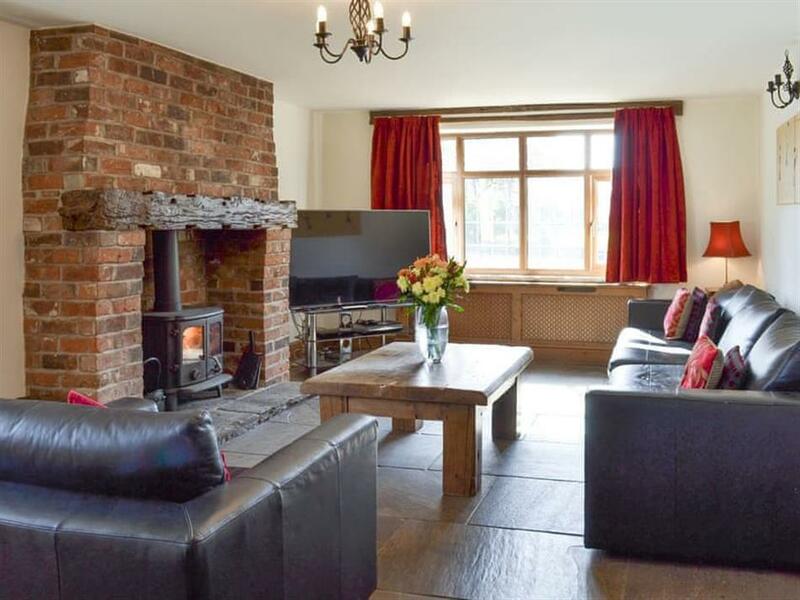 Scraggs Cottage in Cheddleton, near Leek, Staffordshire sleeps 8 people. Scraggs Cottage near Leek is an impressive, stone-built detached cottage in the traditional Staffordshire Moorlands village of Cheddleton on the edge of the Peak District National Park. Full of wonderful character and charm throughout, the property boasts two living rooms, both with cosy multi-fuel burners, and a wonderful farmhouse-style country kitchen and dining area. Outside, the spacious, well-tendered gardens offer fabulous far reaching countryside views and are home to a superb games annexe complete with mini kitchen and brick-built barbecue, perfect for al fresco dining on warm summer evenings. Cheddleton village itself is home to a handful of restaurants, tea rooms and pubs serving food, of which at least one is dog friendly. Stunning walks can be found along the Caldon Canal and River Churnet down to Froghall, where uniquely you can then jump on the Churnet Valley Railway steam train for the return journey. Cheddleton station is an impressive Grade II listed Victorian station, and for any railway enthusiasts it is also where you will find the locomotive sheds and carriage restoration facility, as well as a small museum. A mere 10-minute drive will take you to the market town of Leek where you will find traditional butchers, bakers, greengrocers, delicatessens, cafés and pubs. The Roaches rock formations can be reached in around 15 minutes, perfect for walking, climbing and biking. Tittesworth Water is around a 20-minute drive, where you can walk around the reservoir, bird watch and take part in water-sports or fishing. Britain’s premier theme park, Alton Towers, can be reached in just half an hour. The shop is ½ mile from Scraggs Cottage near Leek, with the pub and restaurant 1 mile from Scraggs Cottage. Living room 1: With multi-fuel burner, Freeview TV, Blu-ray player, CD player and stone floor. Living room 2: With multi-fuel burner and Freeview TV. Kitchen/dining room: Farmhouse style with gas hob, gas oven, fridge/freezer, Freeview TV and tiled floor. Bedroom 3: With double bed, single sofa bed (for flexible sleeping arrangements) and dressing area. Oil central heating, gas, electricity, bed linen, towels and Wi-Fi included. Initial fuel for multi-fuel burners included. Travel cot and highchair available on request. External games room with pool table, gas hob, electric oven, fridge, shower cubicle and toilet. 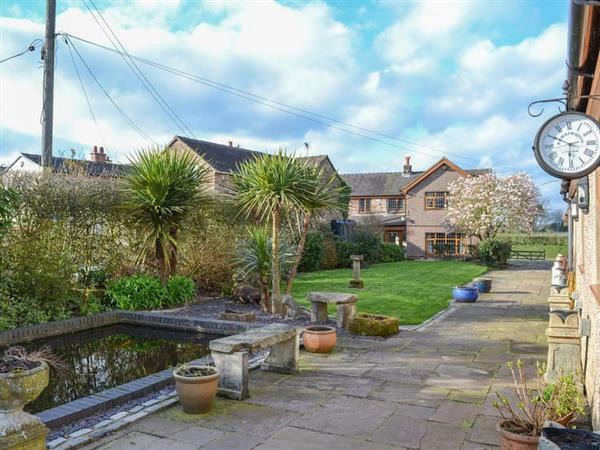 Large lawned garden with sitting-out area, garden furniture and barbecue. 2 small dogs welcome. Bike store. Private parking for 6 cars. No smoking. Please note: There are 5 steps and an unfenced pond in the garden. Holidays at Scraggs Cottage run from Friday to Friday. Pets allowed at Scraggs Cottage. For a better idea of where Scraggs Cottage is, you can see Scraggs Cottage on the map below. Scraggs Cottage is in Staffordshire; should you be on the lookout for a special offer, you can find all the special offers in Staffordshire. It's always worth checking to see what is on offer at the moment. Do you want to holiday near Scraggs Cottage (UK11133), you can see other cottages within 25 miles of Scraggs Cottage; have a look to find your perfect holiday location.